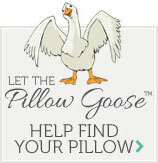 Enjoy the best synthetic down and feather with the Pillow Factory � Housekeeper�s Choice � SPIRALsoft � Pillow! Experience the luxury of SPIRALsoft � with the Pillow Factory � Housekeeper�s Choice � SPIRALsoft � Pillow! If you�ve tried or even heart of SPIRALsoft �, you are in for a treat if you�re a fan of the feeling of down and feather products. SPIRALsoft � is comprised entirely of polyester, but through a unique process of blowing silky spiral fibers, this polyester material develops the loft and comfort of down and feather. To make matters even better, these pillows come at a very affordable price and without the allergy concerns of down and feather products, meaning anyone can enjoy them. Get your Pillow Factory � Housekeeper�s Choice � SPIRALsoft � Pillow today and enjoy the luxury of down and feather in a unique polyester format! We are currently offering this pillow in standard, queen, and king as a single or in sets of 2 or 4.